PROPERTY developer Bolton Bhd plans to launch some RM3 billion worth of properties over the next two years as it aims to become one of the top players in the industry. Most of the new properties, located in the Klang Valley, will be high-end residential units, as it can enjoy better margins. Although costs have gone up by 20-35 per cent, it is difficult to pass them on to buyers who are more price-sensitive. "As a result, a lot of property developers are reviewing not only their sales prices, but their ability to launch the project. However, for properties in the higher-end, I think the demand is still very strong and margins are quite healthy," said chairman Datuk Azman Yahya said after the company's annual general meeting in Kuala Lumpur yesterday. About 60 per cent of Bolton's revenue comes from high-end properties. The company expects higher sales and earnings for the financial year ending March 31 2009, despite the overall slowdown in the property market. "We believe that based on the product offerings that we have and the demand we are seeing today, our numbers for the year will still be very strong," Azman explained. The launches in the pipeline include the Mayang Development - the two-tower 45-storey high-end condominium with an estimated gross development value (GDV) of RM2.5 billion, The Piazza at Puchong (RM105 million GDV), Tijani 3 (RM100 million GDV), and Bolton Court (RM100 million GDV). The company plans to buy more land and take over smaller rivals. It hopes to seal some of the deals over the next 12 months. Bolton now has 340ha, which will keep the company busy for the next five years. Funding is not likely to be an issue, as the company has over RM60 million in cash, and its net gearing has fallen to 0.31 times from 0.67 times. For big projects, Azman said the company may invite private equity funds to take part. Bolton also hopes to sell its non-core assets such as the Campbell Complex and Langkawi Fair by the end of March 2009, to focus on property development. A due diligence on Campbell Complex, which offers an occupancy rate of 84 per cent, is currently ongoing. Azman believes Campbell Complex is worth about RM55 million, while the Langkawi Fair, the island's largest shopping centre, is worth about RM45 million to RM50 million. KUALA LUMPUR: Bolton Bhd is looking to acquire smaller unlisted property developers in the Klang Valley which are facing problems with funding their projects due to the higher costs of construction. Executive chairman Datuk Azman Yahya said the company was currently negotiating with several parties. “We’re in talks with several unlisted property companies with a view to acquiring them and we’re also open to entering joint ventures with private equity funds for development,” he told reporters after the company AGM yesterday. Azman said these companies had land that they might not be able to develop due to their inability to raise funds or were burdened by higher construction costs. Bolton was not looking at specific-sized parcels of land but the value of the land might be over RM100mil, he said, adding that the company was looking at acquiring land in Penang where it recently unveiled the RM190mil Surin, a two-block 28-storey freehold luxury condominium project. “We’re allocating RM100mil in the next 12 months for more land acquisition in Penang,” he said. The company plans to launch RM3bil worth of projects over the next 24 months. Azman said over 70% of these projects were high-end developments. “We expect the current financial year (ending March 31, 2009) to be better than the last one both in terms of revenue and profit despite the slowdown in the property market. This is due to our strong product offerings,” he said. On another note, Azman said the company was still looking to divest non-core assets, such as its construction arm as well as several property investments, with a total value of RM150mil. He said the properties that the company wanted to sell included the RM55mil Campbell Complex located in downtown Kuala Lumpur and the Langkawi Fair valued at RM45mil to RM50mil. “We had a buyer for Campbell Complex but the sale did not go through. “Now we have another potential buyer who is doing the due diligence,” Azman said. For Budget 2009, property developers were hoping for a reduction in stamp duty as well as the liberalisation of the bumiputra quota, he said. For the financial year ended March 31, the company posted a net profit of RM46.7mil on revenue of RM299.3mil. Budget 2009 goodies for developers? BOLTON Bhd hopes the upcoming Budget 2009 will offer goodies to property developers to cushion the "tough times" they are facing, as well as to boost the local property market. "As a developer, we hope to see the construction cost to come down further, like stamp duty for example. But we also understand that the government needs a diverse range of income and government is running (a) budget deficit this point in time," said chairman Datuk Azman Yahya. Developers also hope the government would relax the requirement to set aside a portion of their properties for Bumiputera buyers. Unsold Bumiputera units should also be released faster for other buyers, he added. The 2009 Budget, which will be presented in Parliament on Aug 29, is the most challenging one in recent years, being formulated under tough macroeconomic conditions. The Malaysian economy is grappling with the unwelcome combination of persisting global uncertainties (threat of a US-led global recession, ongoing financial market stress, rising inflation) and domestic-induced risks (mounting inflation risks, weak domestic demand and political flux). The convergence of these two restraining forces is expected to have a larger dampening impact on the domestic economy if the internal engine of growth pulls back sharply. Rising inflation as fuel prices and electricity tariffs rise sharply and political headwinds could slow down growth over the next 12 months. Although the Malaysian economy held up pretty well in 1H08, higher energy costs and soaring food prices will sap the purchasing power of households and restrain consumption over the coming quarters. This, together with the declining values of equities and higher consumer price inflation, has taken a toll on household balance sheets. MIER’s consumer sentiments index (CSI) slumped to a reading of 70.5 points in 2Q08 (115.5pts in 1Q) — its lowest since the 1997/8 financial crisis as deteriorating household income heads the list of minuses in the consumer outlook. In the business sector, firms remain concerned about the difficult operating environment, including sharply rising material costs. The reduced profits and margin compression will lead to lower investment and the firms are likely to adopt a cautious approach towards capital spending given lingering concerns over the political situation. Overall, the government has scaled back this year’s gross domestic product (GDP) growth estimate to 5%, which is at the lower end of the 5%-6% target range. Our GDP growth estimate is a shade higher at 5.3%. For 2009, we expect the government to project a realistic growth range of 5%-5.5% as the lagged impact of price hikes and external uncertainties continues to flow through. Our baseline growth estimate is pegged at 5% for 2009 and there are downside risks to the baseline forecast. In the current turbulence, Malaysia will face slower growth and high inflation, but will escape recession. The country is more resilient now compared to the 1997/98 financial crisis, with stronger corporate balance sheets and banking system, a strong current account position, lower debt and far larger foreign reserves. We expect the economic issues that the economy is facing now to become even more of a challenge over the next 12 months. We strongly advocate prudent financial management and the right mix of fiscal and monetary policies to ease the strain of inflation on the wallet of the man-in-the-street and help ensure a reasonable pace of growth in 2009/10. • Stabilise the prices of essential goods and services. In the past, the government always countered the adverse effects of an external slowdown through counter-cyclical measures. It cannot continue these counter-cyclical measures indefinitely without straining its finances. Although the bumper oil revenue collection from Petronas (42.7% of total Federal revenue and 8.9% of GDP in 2008) comes in handy in part-financing the deficit spending, government expenditure has to be restrained despite the strong demand for more public spending. The government’s financial position remains under strain as fuel and food subsidies rise and project costs increase due to escalating building material costs. The government needs to rebalance its fiscal priorities even though this may compel some rescheduling or deferment of projects. Going forward, it needs to demonstrate financial discipline in its spending programme, in line with the available financial resources. Bear in mind the windfall oil revenue does not last forever. • further restraint in operating expenditure (OE) is critical, especially for supplies and services as well as administration expenses, which account for 19.8% of total OE. The government will remain in a fiscal deficit for the remaining years of the Ninth Malaysia Plan (9MP). The fiscal deficit was brought down from 5.3% of GDP in 2002 to 3.2% of GDP in 2007 but is projected to widen to 3.5%-4% in 2008-09, reflecting largely higher operating and development expenditure. 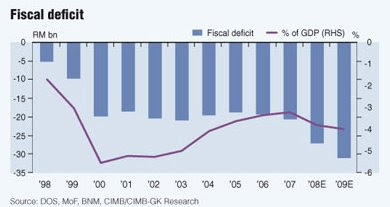 Malaysia is going to tolerate for a couple more years deficit budget spending, which has been the case since 1998. 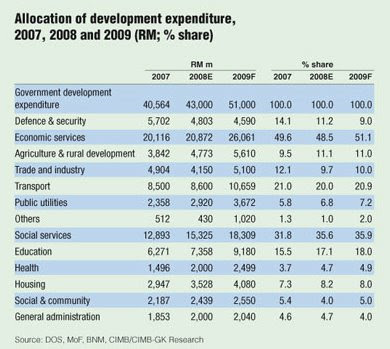 In the Mid-Term Review of the 9MP (2006-2010), the government raised the spending ceiling by RM30 billion to RM230 billion from the original target of RM200 billion. A sum of RM76.4 billion, or 33.2%, of the total RM230 billion has already been spent in 2006-07 and with an estimated RM43 billion to be spent in 2008, this leaves a balance of RM110.6 billion to be spent in 2009-10. Hence, we expect a budget allocation of RM51 billion or 6.7% of GDP for 2009, compared to an estimate of RM43 billion or 6.1% of GDP in 2008. Prima facie, this is positive to the construction sector. However, we would caution that the increased allocation does not mean the roll-out of additional new projects but largely to make up for the increased costs of existing projects. It was reported that the government will revise existing government contracts, taking into account the rising cost of construction. From the policymakers’ comments in recent weeks, we gather that national socio-economic programmes and people-centric projects will be accorded top priority. Spending focus will be on the food security programme, housing, utilities and transportation, healthcare, education and human capital development. A. Provide partial relief measures to ease the burden of rising costs on the household and business sectors. • Lower the Employees Provident Fund contribution rate by 2% (to 9% from 11% currently) for a period of 12 months on a voluntary basis. • Reduce the road tax for private and commercial vehicles. • Reduce personal income tax rates by 1%-2%. The Ministry of Finance appears to apprehend the need for a reduction in personal income tax as the starting point for taxable income is already high. An unmarried individual needs to pay income tax only if the monthly income is above RM2,950 while a married worker is subject to tax only if the income is above RM3,200. Of the 10.5 million workers, only one million pay tax. Of the figure, only 31,000 individuals are taxed at the top marginal rate of 28%. We argue that the lowering of marginal tax rates would reward greater work efforts, boost productivity and retain talent. 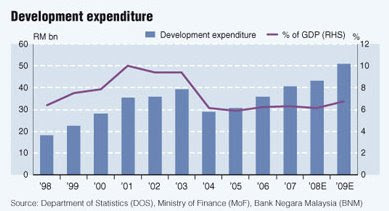 Income tax collection from individuals amounted to RM11.7 billion in 2007 or 8.3% of total federal revenue. Hence, a 1%-2% reduction in the marginal tax rate would result in revenue loss of RM420-840 million per year. • As an alternative to (iii), increase the tax relief for taxpayer and child, or allowances for education and medical expenses. • Provide direct financial assistance in the form of food and transport vouchers for the targeted poor households, which did not benefit at all from the cash rebates of RM150 for motorcycle and RM625 for car owners. It is necessary to encourage greater competition in domestic production and further liberalisation of imports, including licensing and permits to increase local supplies and restrain price increases. The government has lifted the price controls on cement and steel while reducing import duties to increase supply and help stabilise building material prices. Nevertheless, building material prices are still soaring and the construction industry has to bear the escalating costs of construction, ranging from 20% to 30%. • Widen the list of price-controlled items for a stipulated period. • Reduce the withholding tax on dividends received so as to boost the real estate investment trust (REIT) market. The current withholding tax rates for individuals and foreign institutions in Malaysia are 15% and 20%, respectively. In comparison, Singapore’s REIT investors are exempted from withholding tax but foreign institutional investors and corporations are subjected to a 10% withholding tax. In Hong Kong, the withholding tax system no longer exists. It is proposed that tax deduction be allowed for expenditure for the purpose of energy savings, as well as a reduction of import and excise duties on hybrid cars. • Increase the level of tax exemption of withholding tax on interest income earned on savings and fixed deposit accounts of up to RM200,000, instead of RM100,000 currently, or abolish the withholding tax of 5% on interest income earned. As in previous years, higher duties should be imposed on cigarettes to promote a healthy lifestyle.